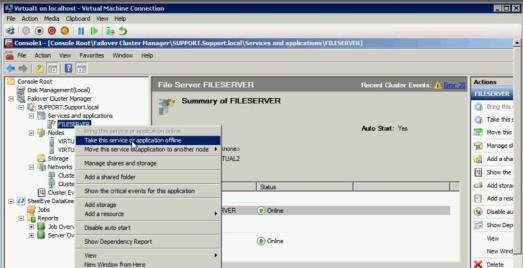 Replace the existing WSFC physical disk resource with a DataKeeper volume resource that supports data replication. Change the quorum type to Node Majority. 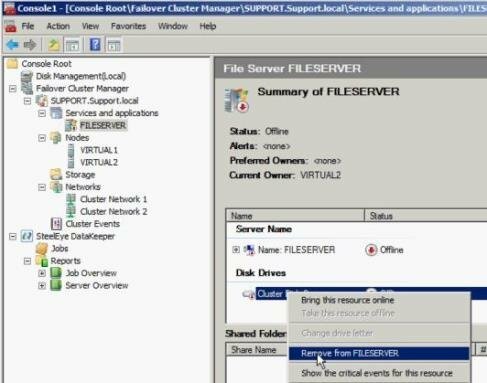 Add the third node into the cluster for failover. 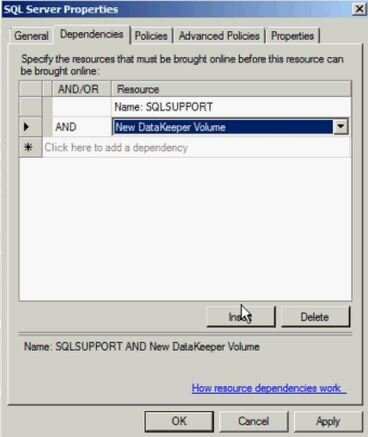 Reestablish any/all resource dependencies to the new DataKeeper volume resource. 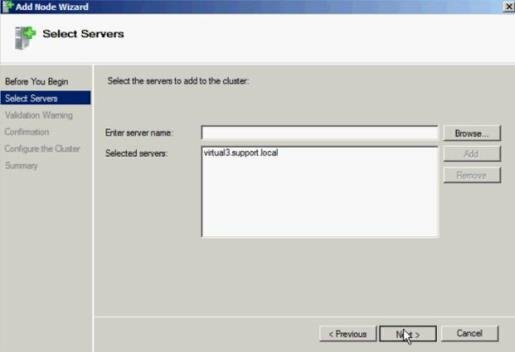 The following example details the steps necessary to extend a cluster resource group from a 2-node cluster to a third node via DataKeeper. Remove physical disk resources from WSFC. This also removes any dependencies on these physical disk resources. These dependencies will need to be reestablished to the new DataKeeper volume resource, so please take note of what these dependencies are before completing this first step by viewing the Dependency Report. Highlight your resource and select Show Dependency Report. a. Offline the cluster resource group by right-clicking and selecting Take this service or application offline. b. 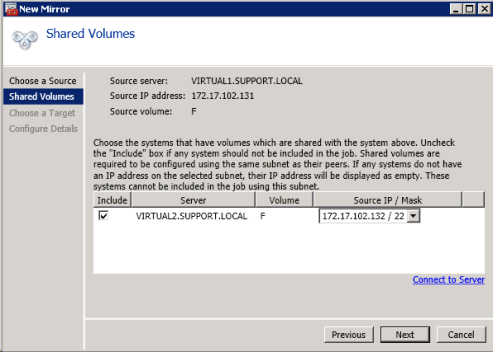 Remove the physical disk from cluster resource group (moves to Available Storage). 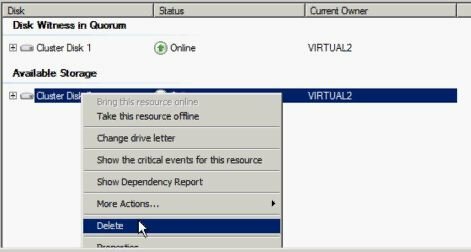 c. Remove the physical disk resource from the cluster configuration by deleting the resource from the Available Storage group. 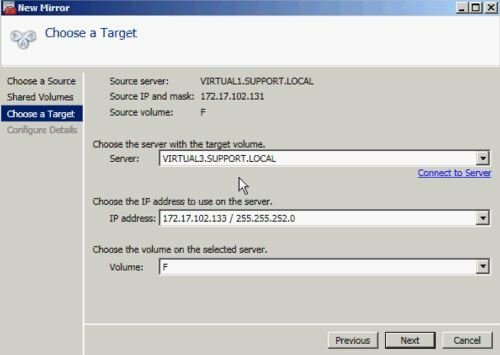 Because there will now be a third node in a remote site, the Disk Witness in Quorum is no longer valid, therefore, the Node Majority configuration should be selected. b. Select Node Majority. Note: Change the quorum type to Node Majority if the final number of nodes is odd as in a 3-node cluster, or Node and File Share Witness Majority if the final number of nodes will be even as in a 4-node cluster. 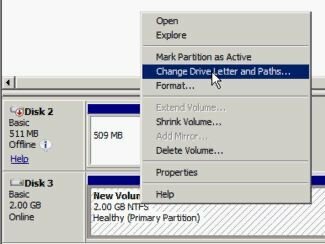 c. Delete disk witness from Available Storage. b. Change drive letter to match previous configuration (if needed). c. Repeat the above steps, 2a and 2b, on all shared nodes in the cluster. Make sure the volume of the third node is available to become a target. It should be formatted and online, and it should be at least as big or bigger than the source volume. a. Connect to all shared nodes and the third node. b. Create a job containing a mirror to the third node. f. Configure Details. Choose compression settings, if applicable, and choose mirror type, asynchronous or synchronous. Select Done. The mirror will then begin resyncing to the third node. After resyncing is complete, the Job State will change to Mirroring. Add third node into the cluster. 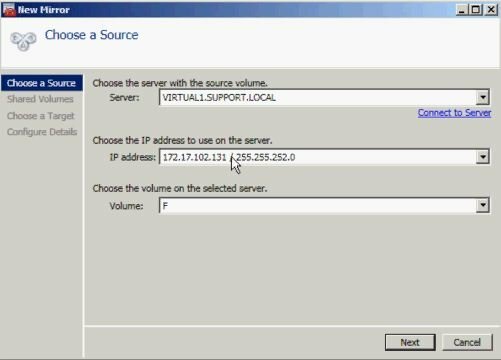 c. In the Add Node Wizard, enter name of server to be added, click Add and select Next. d. Yes may be chosen to perform Validation Testing, but be aware that some errors are expected due to the disk being locked on the target side. 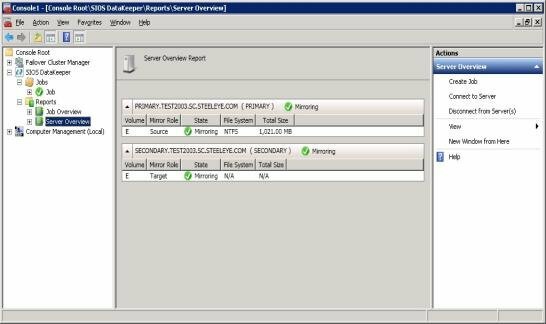 Note: When performing validation testing, select Run only the tests I select, then deselect the Storage tests from the Test Selection screen. 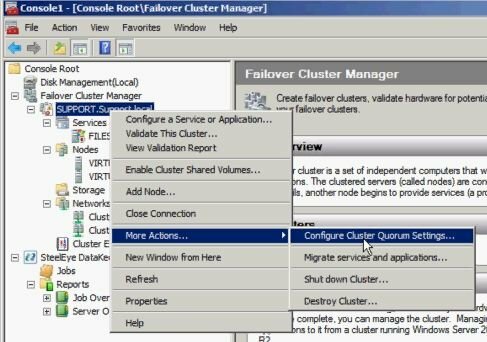 Even though the Storage tests were deselected, the Failover Cluster Validation Report will still report a List Cluster Volumes failure in the Cluster Configuration Test. This, along with a few other warnings, is expected due to the third node and its volume not being shared with the first two nodes. e. After viewing the Validation Report, select Finish. The Validation Warning screen will reappear. Select No to add the node without performing the tests again. f. Select Next on the Confirmation screen. g. The Summary screen will appear indicating that the node was added successfully. 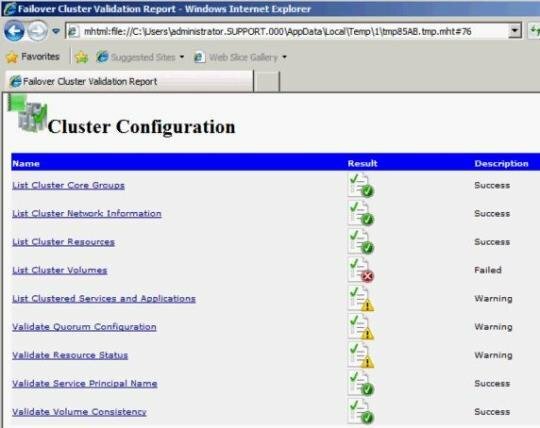 At this point, the cluster resource group is defined across all three nodes in the cluster. a. Right-click application resource and select Properties. b. Select the Dependencies tab. c. Click on the Click here to add a dependency tab. e. Select Apply and then Okay. Dependencies should now be reestablished.